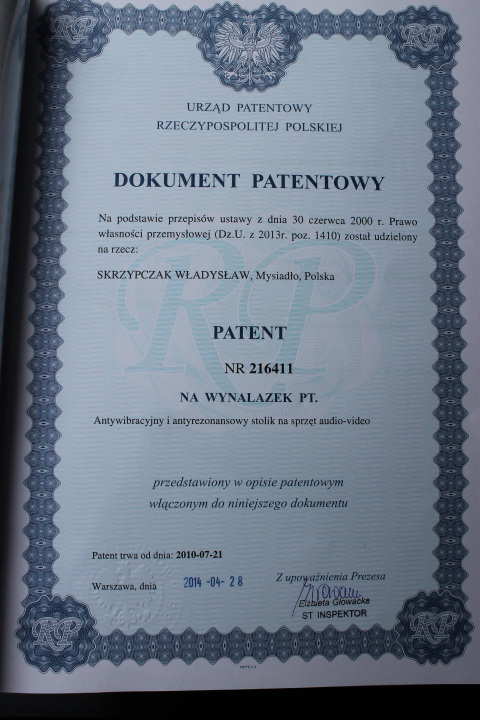 Racks with suspension shelves − PAB AVSS table − is a one-of-a-kind anti-vibration construction, unique worldwide, due to the way of mounting the shelves − patented in the Polish Patent Office − Patent NR 216 411. 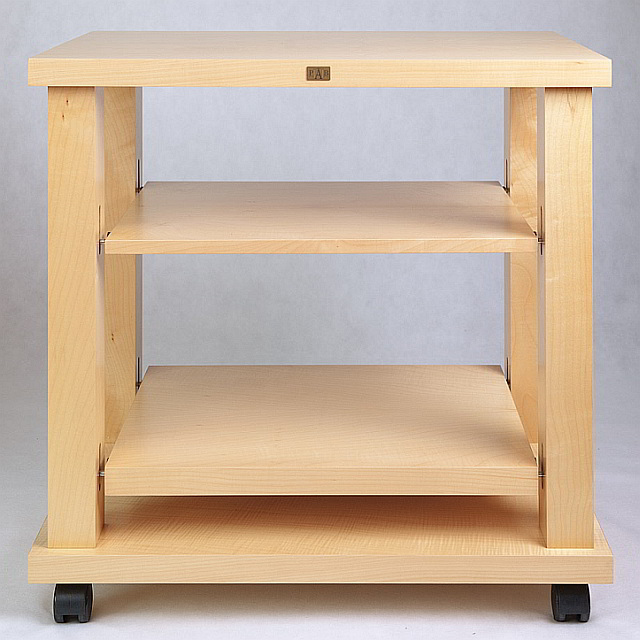 The PAB AVSS table consists of a massive top and platform with two shelves hanging between them (upon order we can make a table with three shelves, or one with the shelves hanging high enough, to place something on the platform, like a heavy amplifier). 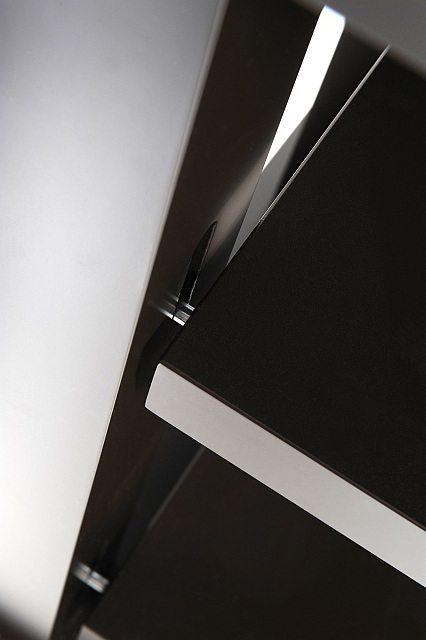 The mechanisms for the suspension shelves are hidden in the table legs, covered with varnished aluminum slats. Similar to the anti-vibration platforms, those mechanisms are made from non-magnetic materials. 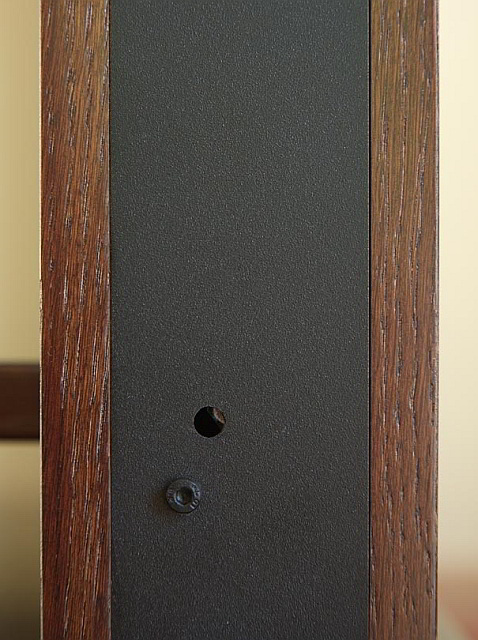 However due to the need to achieve higher load capacity, especially of the lower shelf, designed for amplifiers, those were heavily modified. Also the tensioners were redesigned to be hidden, while still easily operated without the need of removing the lathes. The table is big and massive. The height without feet is 26.6″. Depending on the feet [8 mm (0.3″) pins can be bolted to the platform and then we can use the PAB bearing feet or solid metal feet with the table] it can reach even 29.5″. 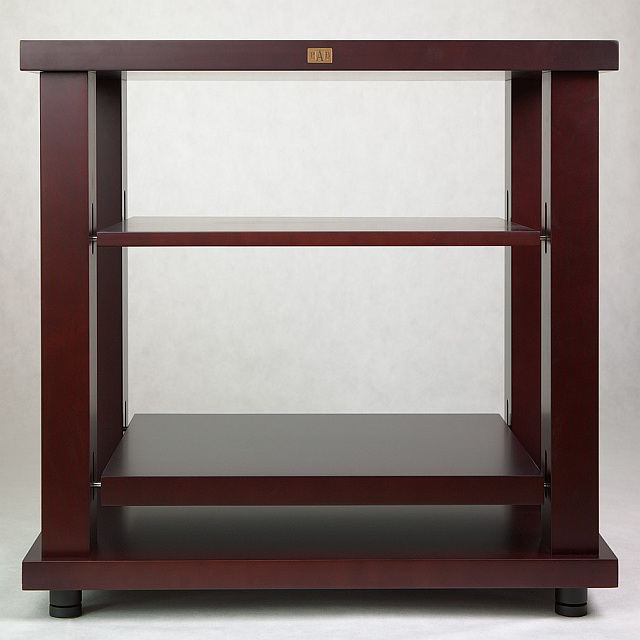 The table top and platform have the same size of 28.7 x 20.1 x 1.4″, while the shelves − 21.7 x 17.7 x 1.4″. The load of the shelves should not exceed 123.5 lb (it can be increased to 145.5 lb, with reinforced mechanisms and thicker strings). The complete table weighs 70.6-79.4 lb, depending on the feet (on demand we can make special 8/6 or 8/10 mm pins, or other sizes − 8 mm/0.5″, 6 mm/0.25″ etc., to be able to use any commercially available feet). The tables offered to clients are ready to use after proper adjustment and levelling of the feet. 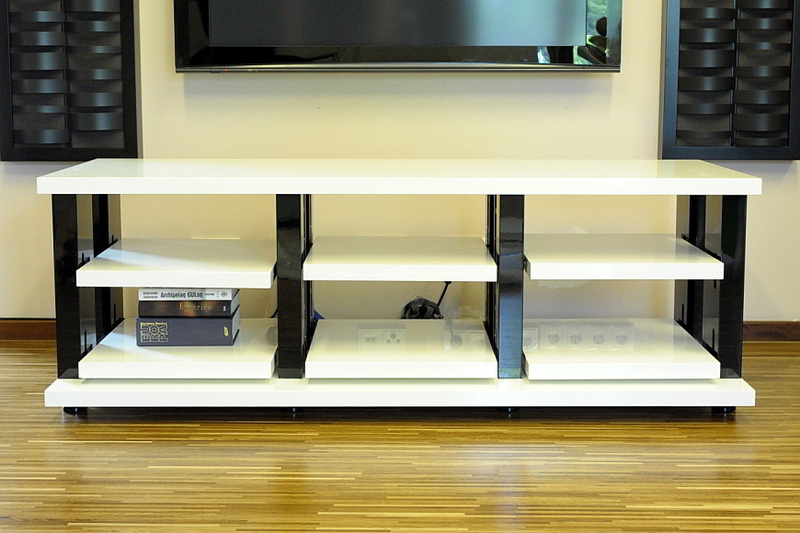 After some time it may happen, that the shelf tilts or does not hang anymoore (the device placed on it can be too heavy for the given height of the shelf, or is heavier on one side). Then you need to raise the shelf using the supplied PAB key. After placing a very heavy device on the shelf you may need to raise and level it again, as the strings may extend a bit. 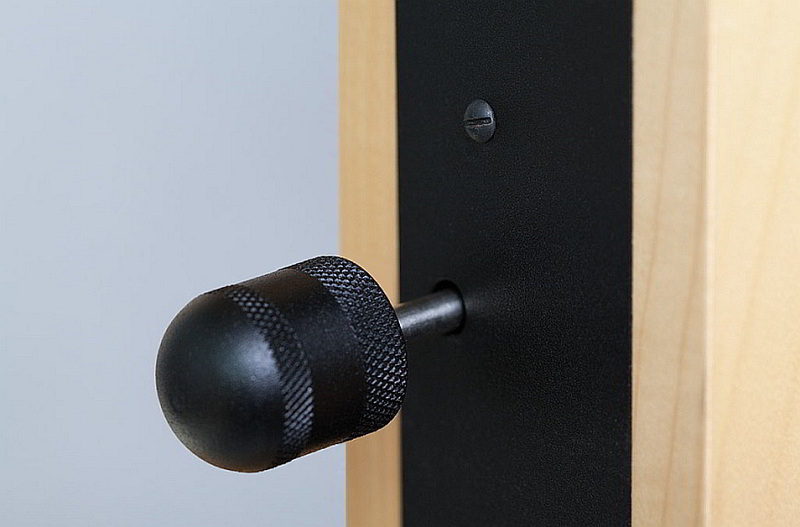 After this, the shelf will hang on the strings freely and will not need additional adjustments (similar to all anti-vibration platforms, free swinging of the shelf is the key factor for the anti-vibration effect). On one shelf only one device should be placed! Using more than one device can lead to overload and decrease of anti-resonance capabilities (also due to the interference of vibration produced by each of the devices). On the big and massive top a turntable or a very heavy power amplifier can be placed. 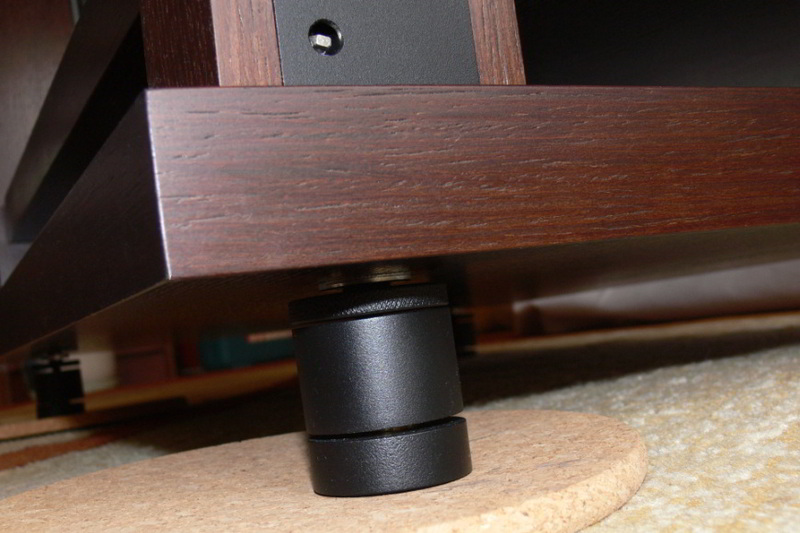 It will carry a load of 352.7 lb, under the condition of placing the table on PAB anti-vibration feet. The top can also be used to support a PAB anti-vibration platform, preferably of SE or reference type.